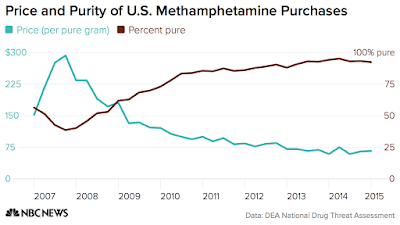 Remember methamphetamine? For those of you actively abusing drugs, or in recovery from narcotics addiction—the answer is probably yes. Much of the general public, however, associates meth with the award winning television show Breaking Bad. Short of that, the drug is probably as unnoticed as it is deadly, today. But before the country realized that it was already in the beginning stages of a full blown opioid crisis in America, talk of drug epidemics was tied to methamphetamine. In the late 1990’s into the early 2000’s, meth devastated individuals and families across the country. During that time the drug was easily manufactured with over the counter cold medicine and crude chemicals in clandestine laboratories. A cheaper, stronger alternative to cocaine. In a number of communities meth use was at epidemic proportions. In response, the government passed the Combat Methamphetamine Epidemic Act of 2006, which made it far more difficult to acquire the necessary ingredients to produce the drug easily in America. The result was promising, federal data indicated a significant drop in meth production, use, hospitalization, arrests and prosecutions. Seeing an opportunity, Mexican drug cartels managed to fill in the void, and then some. 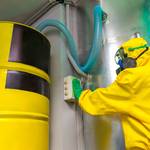 Creating massive super labs to create far more pure batches of the drug, which could be sold for cheaper than ever in the United States, NBC News reports. 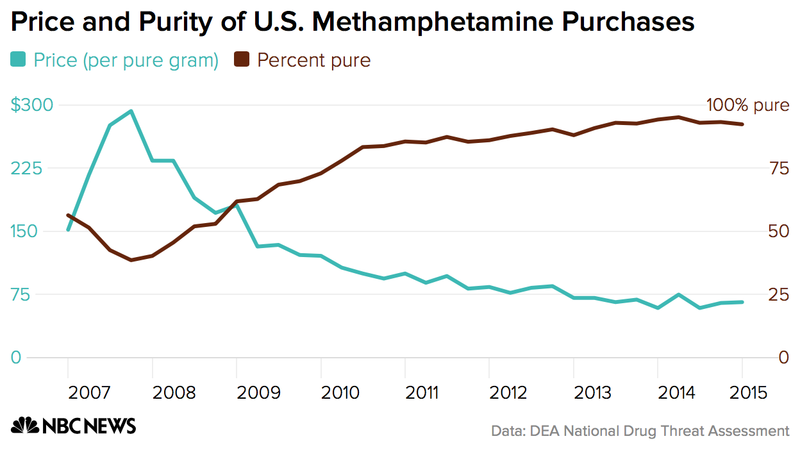 In the shadow of the American opioid addiction epidemic, over the last decade the price of meth continued to drop while the purity got better. While meth addiction is not getting anywhere near the amount of attention that opioid use disorder receives, meth use in Wisconsin has increased an estimated 250 percent since 2011, according to the article. Wisconsin Attorney General Brad Schimel commissioned a study which determined those shocking numbers, and he believes that meth use could overtake heroin at this rate. Meth seizures at the border in San Diego County jumped from 3,585 kilograms in 2012 to 8,706 kilograms in 2016, according to the deputy U.S. Attorney in Southern California—Mark Conover. He says: "We're seeing it pour across the border in bigger quantities. It used to be that loads of 20, 30, 40 pounds were big for us. Now we have 200-pound loads." The tackling of the first meth scourge in America, followed by efforts to address the opioid epidemic, underscores the unintended consequences of making something harder to get versus focusing on treating addiction, instead. Making it harder to manufacture meth in America led to the rise of Mexican super labs and increased use. Efforts to curb prescription opioid addiction by making it harder to acquire drugs like OxyContin resulted in a boom of heroin use. Once again, Mexico cartels step in to sate American demand. Rather than expanding access to addiction treatment, the government focused on cutting the supply. Essentially doing the cartels a great service. In reality, the best way to curb demand, thus removing the need, for supply is to treat addiction. If you, or a loved one is battling meth and/or opioid addiction, please contact Whiteside Manor. We can help.